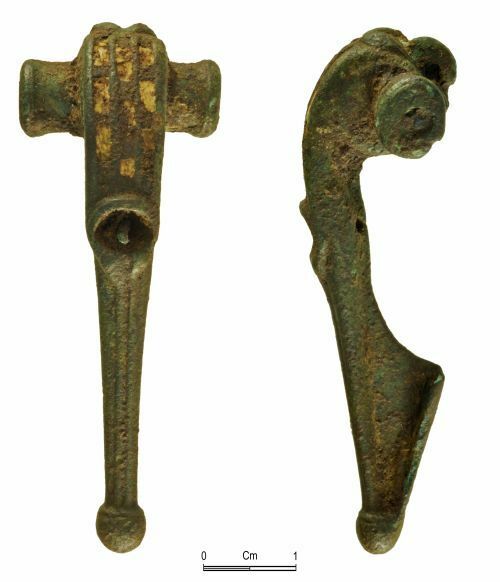 Roman copper alloy bow brooch of Colchester derivative, The Wroxeter, Polden Hill / T-shaped type and of later 1st or 2nd century AD date. The brooch is near-complete, missing the pin and bow setting (with a surviving length of 58.7mm, a depth of 16.0mm and a weight of 18.2g). The spring is secured between perforated lateral lugs and the missing chord was tensioned by a lug at the head, in a 'Polden Hill, lug type' arrangement. The wings are semi-cylindrical (with a width of 22.3mm) and the oval terminals are expanded and ribbed (8.6mm x 7.0mm); there is the suggestion that the terminals were enhanced with a single groove, now worn. The top of the head is decorated with two diagonal moulded leaves, flanking the lug. The sides of the bow have a curved moulding on each side at the head (giving the bow a width of 9.8mm and a maximum thickness of 6.2mm). The upper bow is of D-shaped section, with a rib on the rear of the bow, extending from the base of the head to the catch-plate. The sides are straight and gradually convergent towards the foot. The front of the bow is decorated with three vertical and rectangular cells, holding enamel, now yellow. Rather than the more usual alternating coloured enamels, the cells appear to be separated by a copper alloy borders, slightly recessed from the vertical borders. The mid-bow was decorated by a sub-circular setting (5.3mm x 4.9mm), now missing but originally secured by a copper alloy pin through the rear of the bow. The setting was surrounded by a raised border and at its base is enhanced by a pair of pellets. The pellets are also at the apex of a pair of parallel ribs decorating the leg. The oval-sectioned leg is straight and terminates in a spherical foot knob (5.5mm diameter). The foot is enhanced by a horizontal groove near its top. The catch-plate is central to the leg and there is no surviving evidence of applied decoration on the catch-plate. The surface has a dark drown patina with areas of pale-green corrosion. The brooch may be viewed as typologically unusual; the spring arrangement is typical of Polden Hill type brooches, sometimes seen on T-shaped brooches but both the mouldings and enamelled decoration is best paralleled on Trumpet derivative brooches of Wroxeter Type. The upper Severn Valley predominates the distribution, but the style travelled to the east coast of the Humber and also the Welsh Marches and Lancashire were popular for brooch use of this type of brooch. Class: Colchester derivative, The Wroxeter (Mackreth 2011, Chapter 4, Part 3, Wroxeter, Polden Hill pin attachment, upper bow with three vertical rectangular cells with circular setting at centre below. Spherical foot knob.